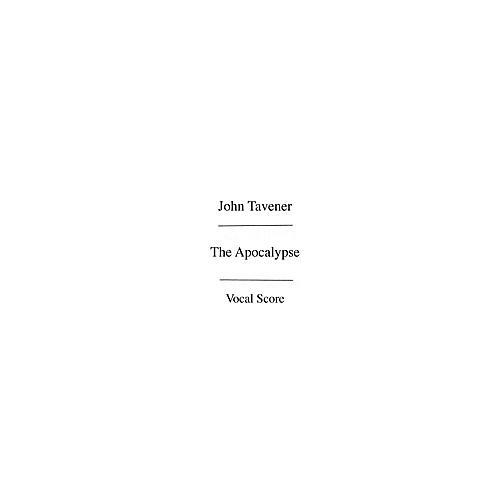 John Tavener's The Apocolypse for SATB choir with piano accompaniment. This work was commissioned by the BBC for performance during the 100th season of Henry Wood Promenade Concerts. It was first performed on August 14, 1994, at the Royal Albert Hall, London, conducted by Richard Hickox, with Thomas Randle (St. John), Patricia Rozario (The Woman), Stephen Richardson (Voice of God), Ruby Philogene (Whore of Babylon), Christopher Robson (Angel), David Nickless (Solo Treble), The New London Children's Choir, the City of London Sinfonia Chorus and the City of London Sinfonia.